We meet Francesca, a 25 years old girl from Lecce. In a few words, she studies medicine and surgery in Rome and she has many passions, such as reading, writing, drawing and, of course, smoking. She likes strong tastes; she smokes Kentucky, mostly, and her favourite tobaccos are GH Dark Flake and Cimette Tornabuoni. Her favourite habanos cigars are Behike 54 and Cohiba Esquisitos, but she loves also Nicaragua ones. 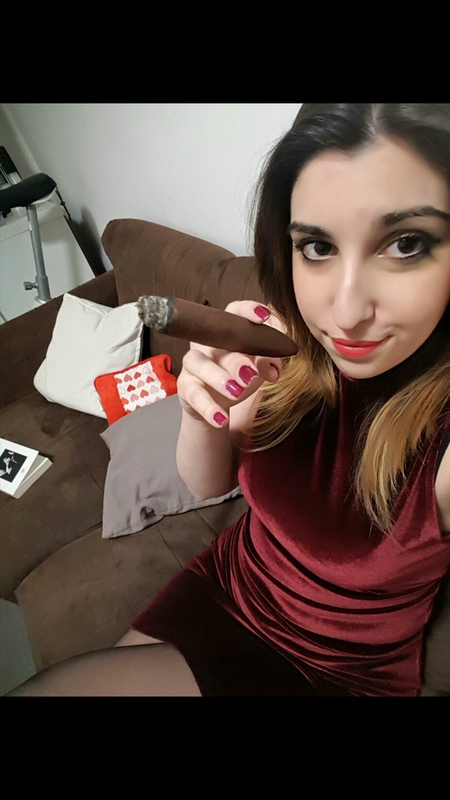 Talking about Italian cigars, she hardly ever smokes something different from CTS and Amazon. She is always looking for improvement and for learning new things. I started smoking cigars nine years ago; I was sixteen years old. My first cigar was Antico (MST), which led me in the world of Kentucky; few years later I moved to Rome, where I fell in love with habanos. In 2015 I started to smoke pipes, but there’s always room for a good cigar. My first cigar is usually lit after breakfast, let’s say at 9.30 am. After that, I smoke very often, shifting from cigars to pipes. I’m not sure I can answer to this question properly: the cigar has been my gate to the wide world of slow smoke, which became, for me, an absorbing interest. I remember that, when I was a teenager, I wanted to try the taste of tobacco, since I had been in love with its scent since my childhood. My grandfather used to dry some tobacco leaves in the place where he worked, and he smoked them in his pipes, so he always had that good smell on. When I smoke a cigar, I remember that dusty place and I feel like a child, in my grandfather’s arms, again. I cut the cigars with a guillotine cutter; when I smoke italian cigars, I don’t cut them: I like to taste their evolution during the smoke. I smoke everywhere! On the sofa, while I’m cooking, when I go out with my friends… If I have to choose a place, my favourite one is definitely my bed. There’s no place like it! I smoke no more than two cigars per day; I balance out with pipes! Thank you very much for your time, Francesca. Good ashes.